A new law gives Kentucky gun owners the right to carry firearms openly in municipal-owned facilities, according to the Evansville Courier & Press. 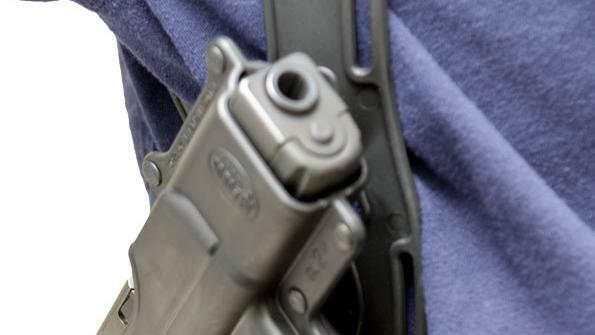 The measure is among the latest so-called “open carry” laws in states and local governments. The Kentucky law reflects a revision approved last year by the state legislature specifying that “local governments can’t regulate firearms,” according to the newspaper. That allows gun owners to carry weapons openly into municipal facilities such as city halls, libraries and parks. The measure only applies to open-carry weapons. Local governments can still ban concealed weapons. Guns are also still banned in some municipal facilities, such as schools and jails. Private businesses can ban firearms as well. The prospect of seeing more guns in city hall and other sites bothers some local officials. “We have serious concerns about the safety implications for our employees of metro government and the public who comes into these buildings,” Jefferson County Attorney Mike O’Connell told the newspaper. Hardin County officials have asked for clarification of whether the new law means gun must now be allowed in the county-owned hospital. And Louisville authorities say the public can bring in guns, but nothing else. “Even though you can bring guns, you can’t bring knives,” one official said. Forty-four states have some form of open-carry law for gun owners. Among the latest — Oklahoma, which began enforcing a new law last year that allowed gun owners with a concealed-carry permit to carry firearms openly. In Georgia, which already has open-carry provisions, the state legislature is considering several other proposals, including allowing students to carry guns on college campuses. Israel has open carry. You can see men and women with so-called assault rifles everywhere for personal defense. I see no problem with it. I am always amazed and amused by comments such as, ““We have serious concerns about the safety implications for our employees of metro government and the public who comes into these buildings,”. Concealed Carry Permits are at an all-time high, you are interacting with armed people every day and you don’t even know it, because we are law-abiding citizens. Open Carry, aka Constitutional Carry shouldn’t phase you.